The Seattle area's tech talent has lured another national restaurant chain to the area. 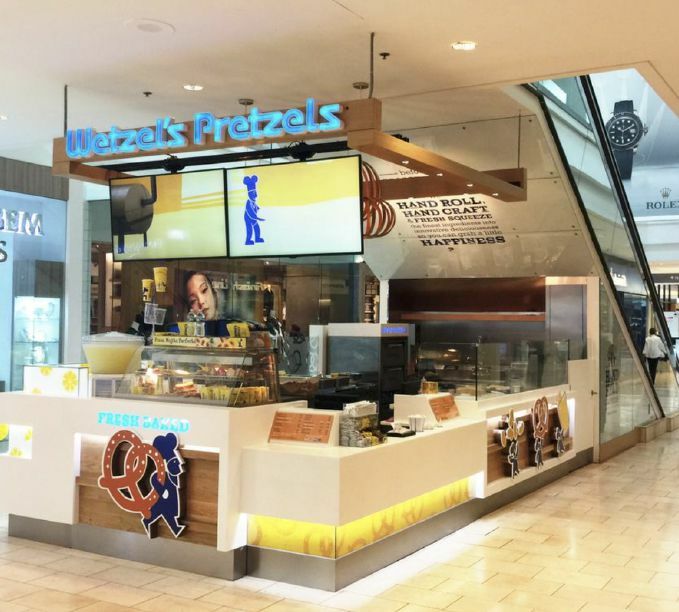 California-based Wetzel's Pretzels is looking for franchisees to open restaurants in at least five popular shopping centers: Pacific Place, University Village, Bellevue Square, Redmond Town Center and North Bend Premium Outlets. Wetzel’s said it views the Seattle area as "a fantastic growth opportunity" because of the fast-growing economy and the fact that it is home to "Microsoft, Amazon and a rapidly expanding workforce," with disposable income. Wetzel's Pretzels launched its hand-made pretzels in 1994 and has grown to more than 340 fresh bakeries across the U.S. and around the world, including locations in Disneyland and Disney World. People interested in franchising need an initial investment of between $164,950 and $405,850. That includes an initial franchise fee of $35,000. They must also have a minimum of $60,000 of liquid cash and a net worth of $240,000. Wetzel’s currently has two stores open in greater Seattle market – one at the Southcenter Mall that opened in 2009 and the other at Northgate that opened in 2013 – and five other locations in the state. The five new target properties have space available, but the company has not negotiated rents yet since it has not yet selected franchisees, said Frank Gonzales director of nontraditional development at Wetzel's Pretzels. Traditional mall spaces are between 600 and 800 square feet. Nontraditional spaces can be kiosk sites, which run about 220 square feet and can having on-site baking or not. External stores that are connected to a shopping center or transportation hub are 900 to 1,000 square feet, the company said. Wetzel's goal is to add a minimum of 10 stores in the Seattle area over the next 10 years, Gonzales said.